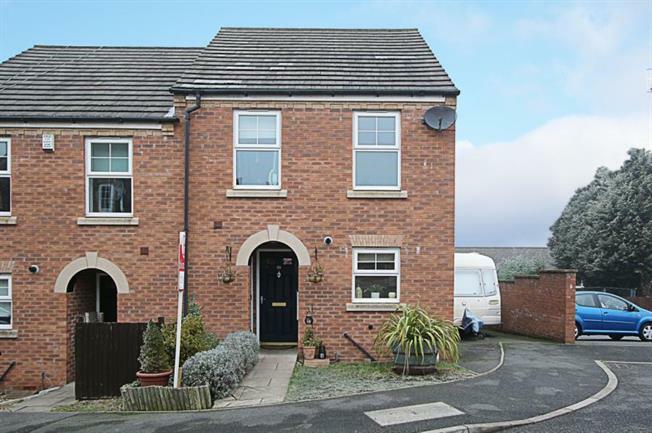 3 Bedroom Town House For Sale in Chesterfield for Guide Price £140,000. A superbly presented three bedroomed town house with contemporary decor. The property features uPVC double glazing, gas central heating, tarmaced hardstanding and enclosed landscaped rear garden which is laid to lawn with patio and driveway. There is a fully fitted kitchen with integrated appliances and a range of wall and base units, lounge with patio doors to the garden and both the fitted bathroom suite and ground floor cloakroom/w.c. have white suites. The property is well served by local shops and public transport services. Hollingwood is a small residential village approximately four miles north east of Chesterfield, Derbyshire. Famous for its Hollingwood Hotel. Hollingwood has to offer great amenities such as shops, a post office and local public houses not to mention the local primary, Hollingwood Primary School, currently with a very good ofsted report. Approximately 3.6 miles via the A619 or A61 to the Chesterfield Town Centre.